For the first time Lepel was mentioned in 1439 in connection with the cession of Lepel estate as a gift to Vitebsk Roman Catholic church made by Mikhail, the son of the great prince of the Grand Duchy of Lithuania Zhigimont Keistutovich. In 1558—1583 a Lepel castle was bulit. In 1793 it became the part of the Russian Empire. In 1797—1805 a hydrologic system Berezinskaya was created near Lepel (the monument of the hydraulic engineering of the XVIII—XIX centuries). In 1805 the town was taken into the treasury and its inhabitants became the lower middle class. 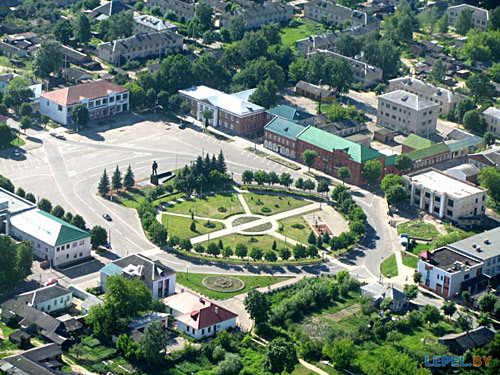 Nowadays Lepel is an administrative, economic and cultural centre of the Lepel region with the population of 20000 people. The industrial complex is represented by 9 enterprises. The joint stock company "Lepelsky concentrated milk factory" has the largest market share in the production of the industrial products (63,3%). Lepelschina is the land of forests (45% of the territory) and lakes (more than 100 lakes). The largest lake is Lepelskoe — 10,8 square km. In its territory Berezinsky state natural reserve is situated — it"s one of the first and the largest ones created in Belarus. There are 48 species of animals, 204 species of birds, many connate plants.